My personal goal is to provide you with advanced breast restoration procedures in a caring and supportive environment. 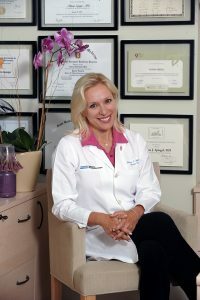 My clinical expertise in breast care includes reconstruction, microsurgery, correction and revisions, enhancement, reduction, specialized perforator flaps such as the DIEP/SIEA and SGAP, sensory nerve innervation, advanced implant reconstruction, fat grafting, direct to implant reconstruction and lymph node transfer for lymphedema. Your successful rehabilitation from breast cancer and other breast related problems is what I strive for. I want you to look in the mirror without your clothes on and feel good at who is looking back at you. My priority is helping women regain their femininity in a way the enhances positive physical and mental vitality so that every patient lives each day to the fullest. I believe that educating ourselves and each other is all empowering and this knowledge allows us to aim for even better outcomes. With this in mind, I hope you will take the time to review me and my practice. In doing so, I hope it will help others who are searching for the right breast reconstruction surgeon. I have several links below where you can provide your candid review. I thank you for taking the time to help me help others. Your suggestions, opinions, and your vote of confidence means so much to me! Read More Many people rely on Google as their primary search engine and is a great place to be found! However keep in mind to leave a review with Google, you will need to be signed into your computer. Open Google Maps and search for me, 😯 On the left side of the page, a box will populate with my business information and right below my name is my star review, a link to score me with stars, as well as write and read my reviews. Read More In 2018, Facebook statistics show there are over 2 billion monthly active users! Imagine that! What a fantastic way to gather and share information and another great place to post reviews. Please join me on Facebook @DrAldonaSpiegel where you can like and follow us. To leave a review, look to the left side panel on the page and click on reviews. Choose a star rating, write a review, select your audience, and don’t forget to click done. Read More Realself is a website that allows you to research treatments, ask questions and get answers from board-certified doctors and specialists for free. You can search specific surgical procedures or be more general in your search, such as breast reconstruction. Realself is a great place to find support before and after surgery, and to share your experience with those considering their own surgical options. To leave me a review on Realself, go to my page and click on start your review. You will see my current star rating, can read my reviews, experience, the questions I have answered, as well as some of my before and after pictures. Read More Yelp traditionally has been a review site for consumers of the traditional marketplace such as restaurants, car dealerships, and beauty salons. More and more people are turning to Yelp now to find doctors and dentists through patient and family reviews. If you would like to review me or my practice, click on this link or search my name, and click on write a review. You’ll be asked to provide a star rating and write a review. Alternatively you can share your feedback by texting Spiegel to 310-494-2829 or by visiting this link. My office will receive your feedback and it will automatically place your review on one of the many review sites on the web. We welcome your comments and encourage you to contact the office if you have any questions.